← Life on the Ledge, or Leaning on the Lord? 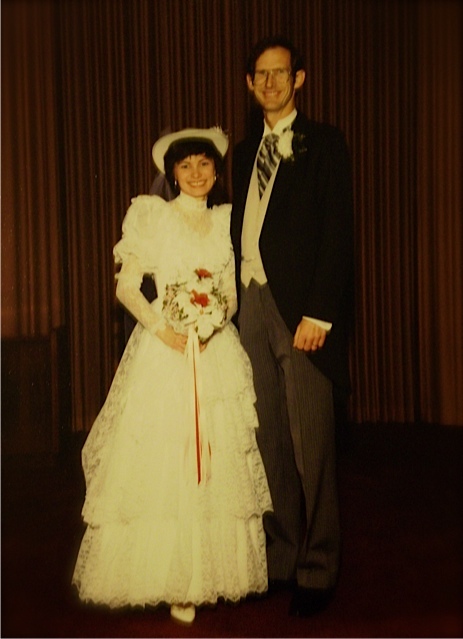 On this day twenty-four years ago I married my best friend. To me that statement is a testimony to the great relationship Gwynly and I have. Now that doesn’t mean our two dozen years of togetherness have been all sweetness and light because they haven’t. We’ve dealt with a miscarriage, job uncertainty, and the loss of his dearly loved parents, as well as some minor annoyances along they way. But we’ve shared many wonderful experiences: living in Germany four years, welcoming our daughter to our family, buying our first house, watching our daughter grow into a fabulous young woman we respect and admire, to name but a few. Gwynly truly is my best friend and, as I like to say, my better two-thirds. Happy anniversary, Gwynly. I love you! I’m curious how many of you are December brides like me. Did any of you get an engagement ring as a Christmas present at some point? This entry was posted in My Journey and tagged Keli Gwyn. Bookmark the permalink. Congratulations, Keli! Being the romantic that I am, when I first saw this picture I immediately thought…how on earth did such a tall fellow lean down to kiss his petite, little bride?! You both are lovely! And it’s so wonderful that you can look back through your years together and recognize the tough times as “seasoning” and the great times as fond memories. I was a July bride, but for Christmas the months before, I did receive a dozen roses. Cynthia, my groom anticipated that very event. He asked his father and one of his woodworking buddies to build a footstool, which Gwynly had his groomsmen pass down to him at the appropriate point in the ceremony. He set it in front of me, I mounted it, and we kissed. I knew the passing of the footstool was coming, but our guests, of course, didn’t. They weren’t sure how to respond since the rest of the wedding had been quite formal and dignified. When we watched the video later we saw that some had laughed, some gave a clap, and others stared in wonder. How utterly romantic! You MUST work that detail in, in a future novel! Happy anniversary! I love looking at wedding pictures! 🙂 You haven’t changed! I want to be able to say that after 24 years. Hope you’re doing something special to celebrate! Happy Anniversary from another December bride. Friday will make 28 years for us. Happy anniversary! I hope you and your sweetie have a wonderful time celebrating! Did you incorporate Christmas into your ceremony? We did. My maid of honor and bridesmaids wore red dresses, and we carried bouquets with poinsettias and decorated the stage with them as well. Happy Anniversary to you and Gwynly 🙂 No, I did not marry in December or get the ring for Christmas. The ring came on All Saints Day and the marriage planned for Valentine came on Lincoln’s Birthday. Sadly, we were among the other statistic that didn’t make it, but before that we were fortunate enough to have two beautiful children together and for that I am always grateful. Florence, I’m sorry you’ve suffered the pain of a broken marriage. I can empathize. I’m thankful the union resulted in your two beloved children. Have a wonderful time celebrating your son’s birthday today.Great name! Happy Anniversary. If my ex and I hadn’t broken up we would have been together 2.5 years (and three days) and maybe there would have been a ring for Hanukkah. In the end, I am better off without him, but it’s hard to keep myself from feeling wistful and wondering what if. I’m sorry things didn’t work out for you. Broken relationships are so painful. Hugs to you, my friend. Happy Anniversary, Keli and Gwynly! I’m also a December bride. Last Friday, Peter and I celebrated 22 years. We had a Christmas wedding complete with trees, garland, white lights, and snow. Happy Anniversary, Keli and Erica. Keli, you and Gwynly look great! I married 20 years ago and got divorced in 2007 as my hubby looked out for someone else when I was ill and injured…lol. So I am “happily divorced”..haha. I have a wonderful son from that marriage who lives with me, and I have kept the lovely surname of my ex husband…lol. Happy anniversary, Keli!! Congrats on 24 years. (((((((((((((((((((Keli)))))))))))))))))) a big virtual hug …for the losses of beloved ones in your life. Congrats to you and Gwynly on 24 years! Love the picture! You guys rock! no december bride here. my best friend got married in the 6 months prior to my wedding in June, so she was the december bride. Happy Anniversary, Keli! Your loving marriage is a testament to God’s grace and blessings. Your wedding photo is beautiful! You look radiant, and I love your husband’s tux. It reminds me of a Victorian gentleman. Did your wedding have a theme? Congratulations! A long lasting marriage is a mark of true Christ-like love. I loved hearing about “the stool” in your wedding! That is priceless! Happy Anniversary. I loved reading about the stool, too. How sweet. I wish you many more. Happy anniversary, Keli. You were a beautiful bride. True story: I did receive an engagement ring one Christmas. And then I gave the ring back five months later. I met my future husband the next month … and married him less than a year later. Happy anniversary, Keli! What a special time to celebrate such a special milestone. Happy Anniversary, Keli! Hope you’re doing something romantic! I was a May bride! Spring here is so pretty and in May the grass is so green and the flowers are just starting to bloom. December here is not nice – cold and usually snowy. This year is the exception so far.